Still standing (and swaying), Theresa May survives, again. If nothing else, there is something truly impressive about Theresa May’s sheer bloody-minded resilience. Humiliated in London, Salzburg and elsewhere, she just keeps hanging on. While many in the Brussels-bubble can hardly believe it, May ended the party conference season with her position as Prime Minister strengthened. Britons respect ‘triers’ even if they are incompetent. From Captain Scott to Dunkirk and the England cricket team, glorious failure is written deep into the British psyche. 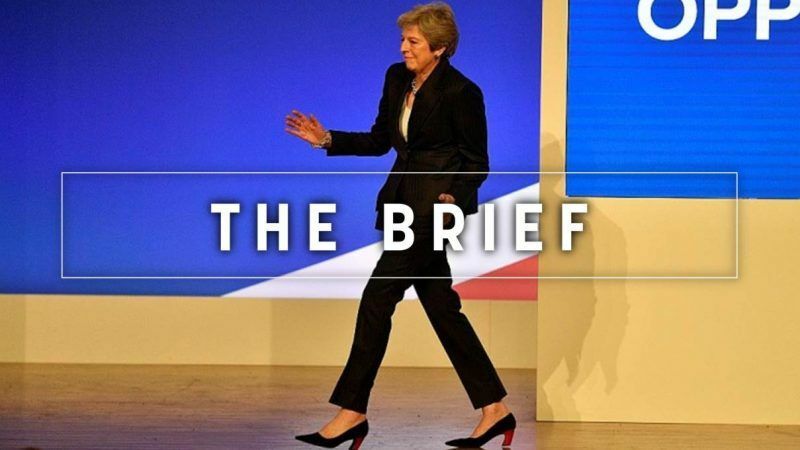 Her speech on Wednesday didn’t contain anything new – though by swaying to ABBA on her way to the podium she gave the press corps the chance to exchange quips with the Commission’s Margaritis Schinas at Thursday’s midday briefing. In terms of substance, it was more of the same. The UK wants a Brexit deal but won’t accept the Commission’s backstop on Northern Ireland. Chequers is the only game in town and, if nothing else is on offer, no deal is better than a bad deal. Plus ça change. ‘No deal’ it is, then? Except for the fact that the tone was undeniably different this time, and that gives this correspondent hope that no deal will be avoided. When this correspondent was last in Birmingham attending the Tory shindig two years ago, the sense of triumph was unavoidable. Three months after winning the referendum, this was the high water mark of British Euroscepticism. “If you believe you are a citizen of the world, you are a citizen of nowhere,” May told delegates, a barely concealed kick in the teeth to Remainers. This time May insisted that she would deliver a Brexit that was ‘in the national interest’, and sought to pitch her speech at the political centre ground. Boris Johnson’s ‘buccaneering Brexit’ speech a day earlier was well-attended but most Tories believe that his chances of the grabbing the premiership are diminishing by the day. Two years ago, the idea of Brexit being unpicked or unravelling would have been dismissed as a fantasy. No longer. The chances of a second referendum are still slim, let alone voters backing a ‘Remain’ option, but they existed even before Labour formally opened the door to a second referendum. In truth, Labour doesn’t want another referendum. Its main play over the next six months will be to force a no confidence vote and a new general election whether or not Mrs May manages to cobble together a compromise with the EU. Either way, Brexit is under threat. May’s main message to her warring party was: ‘back me or risk no Brexit at all’. That may buy her enough wiggle room to strike a compromise in Brussels. Whether she survives to give another conference speech next October is another matter. Dutch military intelligence disrupted a Russian cyber-attack on the Organisation for the Prohibition of Chemical Weapons, while the UK uncovered Russian military intelligence as the origin. War games are back: NATO will conduct its largest military exercises since the end of the Cold War in Europe’s north amid growing tensions with Russia and Trump’s uncertain commitment to transatlantic security. The US and EU should ‘clean the house’ and deal with China, US ambassador to the EU, Gordon Sondland, told EURACTIV. He also said that Washington is ‘fully compliant’ with EU privacy shield and has an ombudsman to monitor complaints in the field. Ahead of the European Week of Regions and Cities, the debate on Cohesion policy continues to spark tension inside the Brussels bubble as well as among stakeholders and networks of regions and cities across Europe. Great expectations resurface, as Poland’s turn at holding the UN’s annual climate summit is meant to be the one shot at making the Paris Agreement a reality and making it fair for everyone. One of Europe’s most influential business lobbies is trying to push the EU towards climate action standstill, after a leaked memo obtained by EURACTIV called the bloc’s existing 40% emissions reduction target “already ambitious”. The EU’s top judge backed the ECB national bonds purchase policy in response to complaints raised in Germany. Banks doing business in Estonia, which has been at the centre of a money-laundering scandal involving Danske Bank, handled more than $1 trillion in cross-border flows between 2008 and 2017.